The Integra Ti incorporates biocompatibility materials for the safety of your patient’s specimen. Unique touch screen quadruple heated stage system and digital help function. Heated stages accuracy to 0.05oC and XY stage control. Large stage surface Rapid micropipette setting-up facility. Supplied with unique air syringes for ultimate control. Mechanical coarse and fine xyz for the smoothest and most accurate movement available. Options to upgrade the system for PGD (Pre-implantation Genetic Diagnosis) or glass heated insert. 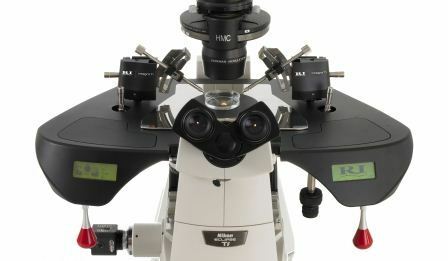 Install onto all popular microscopes with just 4 screw.